Microsoft developed the C# programming language sometime around 2000. 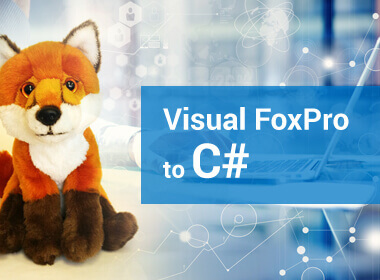 Our intention is to provide a strong overview of what C# offers and help developers assess its rich features through the lens of Visual FoxPro. It is not possible to convert a Visual FoxPro application to C# in one go, it requires proper planning, effort, and resources. Choosing an automated conversion will only result in a rough translation with comical value and no business logic. Migration from Visual FoxPro (VFP) to C# will require many judgment calls based on project requirements. Considering the projects we have come across so far, the client requirement has often been for an apples-to-apples conversion or a customization implementation. In apples-to-apples conversion, the client wants their VFP application converted to .NET/C# as-it-is with respect to the user interface and functionality, with a provision for enhancements. Apples-to-apples conversion model is best suited for companies in stable business environments where there are few changes in the company’s business requirements. In customization implementation, the VFP application is converted to .NET/C# by adopting changes to the user interface and functionality impacting the overall business logic of the application. Customization implementation is best suited when there are significant changes to the business and they want to take advantage of the new platform and market trends. Why move your VFP application to C#? With Microsoft no longer supporting Visual FoxPro there won’t be any more patch updates for security, stability, or enhancements. This makes the applications running on VFP highly unstable and vulnerable to security threats. In order to overcome these drawbacks, businesses are forced to migrate their applications to a more modern programming language like C#. Another matter of concern is a depleting pool of VFP developers, as there are very few qualified resources to maintain your current VFP application. Moving on to C# is ideal as it has many built-in features. Using C# businesses can develop new functionality to their old application without drastically affecting the application. Migration from VFP application to C# offers many development choices. One of the main advantages of C# is that it runs on CLR making it easily integrate with other language components that are CLR compatible. Also writing in C# gives access to all the .NET framework library and a powerful form engine. Being a pure object-oriented language, C# allows creating modular maintainable applications and reusable codes, where every simple data type is treated as an object. C# is backed by a huge supporting community with lots of reference materials available online in Google or Stack Overflow, which makes development much easier. Another remarkable feature that C# offers is that it is highly flexible to develop a variety of applications in windows, websites, games, and even mobile apps with some additional frameworks like Xamarin or Mono. Analyzing the Legacy Application – We do an in-depth study of the legacy application with our SpecGenerator tool to capture all the functional requirements. This tool is a system analysis document generator that creates specification documents by reading VFP forms, programs, and classes. With this tool, we can dramatically reduce the overall analysis effort of any new migration project. Migrating the Database – This is a critical task made efficient with Macrosoft’s vDBF Converter. It automates the migration of a VFP DBF database into a Microsoft SQL database. With this tool, we can reduce the overall resource allocation and timelines for migration projects. Finalizing the Layout – After analysis, a clearer picture of the new C# application begins to evolve. A finalized layout of the new application is derived by considering the list of functional requirements and collaborating with the client to approve the finalized layout. Implementation based on Business Needs – VFP application may be migrated to a web or desktop C# application based on the business requirements of the client. New application is implemented by segmenting each functional module into different milestones. We house a specialized team of migration experts who understand the business logic required to successfully convert the VFP code into the new C# platform. Our skilled programmers follow well-defined coding standards and industry-wide best practices to produce extremely well-written programs. Contact Macrosoft to determine the best approach to start your journey toward modernization!